We took a bit of a detour while in central Utah to visit a national park just across the state line in Nevada: Great Basin National Park. The off-the-beaten path park, #20 on our list of national parks visited on this trip, quickly became one of our favorites — in the top three along with Glacier and Theodore Roosevelt. The park, created in 1986, is named after the massive Great Basin, which covers almost all of Nevada — stretching from California’s Sierra Nevada mountains in the west to Utah’s Wasatch Range in the east. 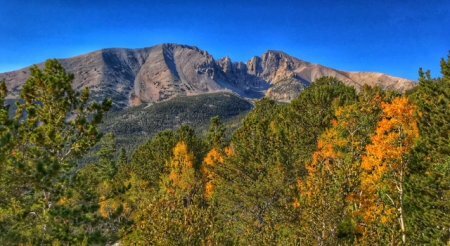 The park protects a desert mountain island of the Snake Range — offering a flat, sagebrush environment at its base (at about 5,300 feet elevation) to multiple ecosystems and forests as the elevation climbs to the 13,000+ foot summit of Wheeler Peak. It also includes a limestone cavern — and visitors can purchase a choice of guided tours of the Lehman Caves. Our first hike was the moderate 4-mile Baker Creek Trail, which starts at an elevation of about 8,000 feet and goes to about 8,800 feet. It is a beautiful hike through alpine forests (of spruce, firs and limber pines) and open meadows and along the creek, though parts are quite rocky. The aspens were just beginning to change at this elevation — as can be seen in the collage above. Our second hike started at one of the highest points in the park — right next to the Wheeler Peak campground at about 10,000 feet. 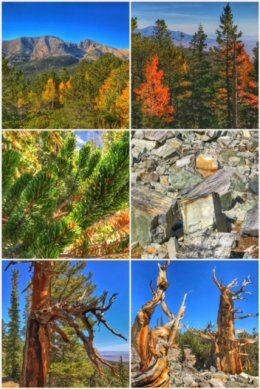 The 3-mile Bristlecone Trail was also a moderate hike — and very rocky — but the payoff is a grove of ancient (some up to 5,000 years old) pine trees. 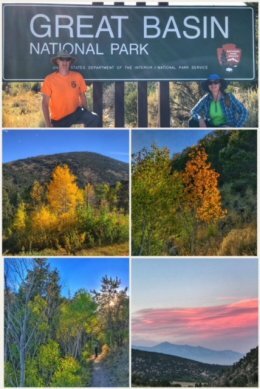 Both the drive up to this hike — which includes stops at several overlooks — and the hike itself include absolutely amazing vistas of autumn colors: golds, oranges, and red of large aspen groves. We literally stopped in the road multiple times to gawk and snap pictures. Wow. The hike to the bristlecones offers views of colorful mountainsides and breathtaking valley views… before finally reaching these amazing trees, with heartwood you have to see to believe. It was wonderful and empowering to look at these trees and contemplate that they have been alive for thousands of years. 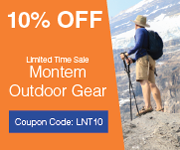 For those seeking more challenging hikes, the parks offers a large selection — including Wheeler Peak Trail (8 miles; 2,900 foot elevation gain) and Baker Lake Trail (12 miles; 2,600 foot elevation gain). For the rest of us, there are plenty of moderate hikes — but very few easy ones. The Lehman Caves — which is just a single cavern — extends a quarter mile into the limestone and marble that flank the base of the Snake Range. 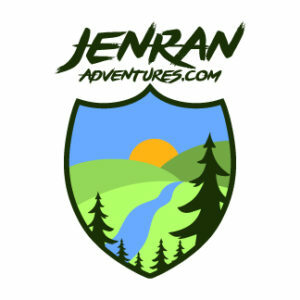 The ranger-led tours can be booked in advance, and are certainly worth it — especially if you love caves or have not been in many. We opted for hikes on this visit simply because the weather was perfect and the autumn colors beautiful. Great Basin National Park is a bit hard to travel to, but wow… it is certainly worth making the effort. The park is simply a natural wonder — with something for every nature-lover!